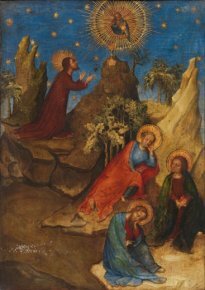 11/2/12 - Acquisition - Madrid, Museo del Prado - Starting today, this museum in the Spanish capital will display an early 15th century French painting, acquired in May 2012, representing Christ in the Garden of Olives with Saint Agnes and Louis I d’Orleans as a Donor (ill. 1 and 2). The prince was identified thanks to the gilt thistle leaves shown on the sleeves of his robe. This panel, no doubt the central part of a triptych, is the only known painting representing the Duke of Orleans, the brother of Charles VI, who was appointed regent after the king became crazy. Following a thorough study by the Prado, a fundamental restoration (by María Antonia López de Asiaí) removed the many repainted portions which totally concealed the figures of the donor and Saint Agnes. The cleaning also revealed the work’s dazzling colors, in excellent condition given its age. The work had been brought to the museum by its private owner in order to have it examined and perhaps offer it for sale. The iconography, the style of the painting which indicates that it may have been produced in Paris, as well as its very fine quality, would appear to show that it could be attributed to Colart de Laon, documented between 1377 and 1411, valet de chambre to Louis I d’Orleans and famous painter, who remained after the death of the duke in the service of his son Charles. Though there exist many illuminations from this period, painted works on panel are particularly rare today and none has been clearly authenticated as being by Colart de Laon. Previous article in News Items : Will the Organ in the Church of Saint Jacques also Be Destroyed ?